When my children asked the organizer if there were any famous people there who might sign autographs she disappeared. 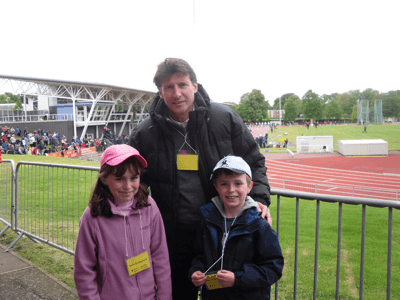 Two minutes later she returned with Sebastian Coe (arguably one of the world’s great athletes of the 1980s and 1990s and now in charge of the 2012 Olympics) in tow. He signed autographs, asked them about their Sporting interests and kindly posed for a picture. It all made for an amazing day out which we will not forget. And it has really made a big impact – all those University emails for donations will now be looked at in a very different light and my family are now really interested in the London Olympics, an area which never registered before. As a blog writer, I like to analyse things, especially really good or bad experiences. On the long drive home, I thought about the whole event and I think there are some clear principles on making someone feel like a VIP. 1. It must be selective – not everyone can be a VIP so you need to choose which select group you want to target. 2. It must be something you cannot directly buy. I was a VIP because I had attended Loughborough as a student – so I received a VIP invitation. Being a VIP is a gift you choose to give out. 3. It must be special and memorable (and it was!). 4. No mention of money. Being a VIP is a unique gift you give to special people/customers. If you have chosen your VIPs wisely, there will be a big payback down the line. So don’t spoil the moment. If you worry about the cost, you are targeting the wrong group. It has to feel genuine and asking for a contribution would be the easiest way to ruin it. 5. It is not actually that difficult (or costly) to make people VIPs. The skill is in choosing who to bestow it on. So I spent my sunday watching some really good athletics with my family and feeling really looked after. And it has given me (and hopefully you) some ideas on how to replicate the feeling.